The 6inch Howitzer 26cwt was a British Artillery piece developed during WW1 and used in both WW1 and WW2. Design began in early 1915 and it entered service in late 1915. It replaced the obsolete 6inch 25cwt gun. The combined firepower, range and mobility made it one of the most important artillery pieces of WW1. Originally designed to be towed by horse by 1916 it was commonly towed by a 4 wheel drive 3 ton lorry. The WW1 version had wooden wheels that could be fitted with ‘girdles’ for movement in the mud of the battlefields. Towards the end of WW1 it was fitted with solid rubber tyres. These guns fired an estimated 22.4 million rounds along the length of the Western Front. After WWI and in the intervening period before the start of WW2 the carriage had its wooden spoke wheels replaced with modern pneumatic tyres. During WW2 it was deployed with the BEF in France and saw active service in the early campaigns in N Africa. With the introduction of the 5.5 inch gun its deployment was restricted but it was used in Burma and finally withdrawn from service in 1945 at the end of the war. It was designed by Vickers and manufactured by Vickers, Beardmore, Coventry Ordnance Works, Woolwich Ordnance Works, and the Midvale Steel Company. Approximately 3,633 were produced and it was crewed by 10 men. It could fire Gas, Incendiary and High Explosive shells to a range of 9,500 yards in WWI and to 11,400 yards in WWII. The shell weight during WW1 was 100lbs and 86lbs in WW2. Captured guns were use by the German and given the designation FH-412(e). 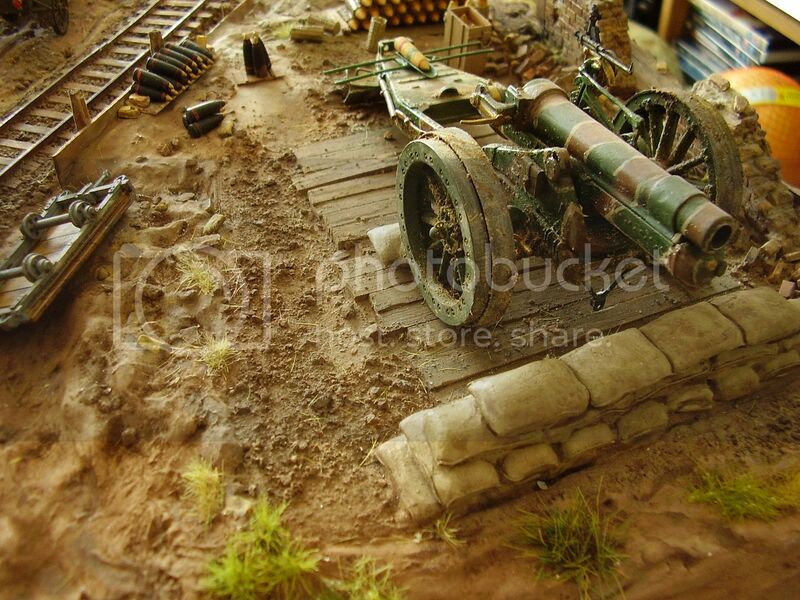 The build features the 35.1225 kit suitable for the BEF or North African campaign. The base is a small temporary one and the ammunition load is also from Reiscast as are two of the figures with the seated chap coming form Sovereign. very nice diorama. I particularly like the crew. Well done. Looks very good Alan. Great composition with the gun and the figures and that really neat groundworks. Very nice feature. I was curious about that indeed as i read the base was a temporary one and you probably have great ideas as to where the howitzer is going to end up. But it is almost a shame as the whole scene fits so neatly onto this base. Is that also the reason why the guns tires are looking so clean? Very nice job Al! I agree with Faust, its a shame you don't intend to use this base, it really works very well. Having said that I look forward to the final scene as you are planning it. Keep up the great work! 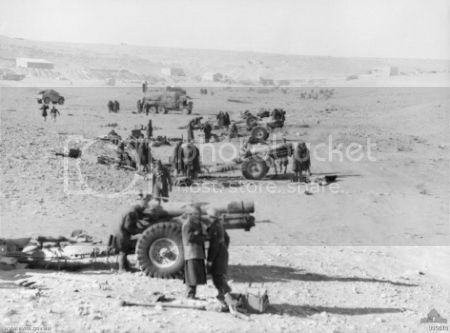 If I remember correctly, the 6" howitzer was the gun used by the comedian Spike Milligan's regiment (mentioned in his book 'Rommel, Gunner Who?'). If I'm correct then they used the Scammell as a gun tractor. Nice work as always from a master modeler. Waiting for the AFV Club Matador release to build my howitzer.